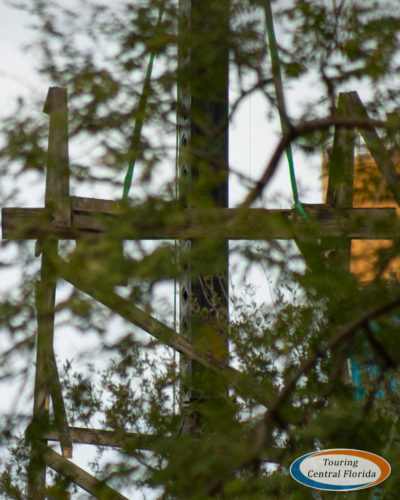 More and more of the former Gwazi roller coaster is coming down at Busch Gardens Tampa Bay, where Rocky Mountain Construction (RMC) is currently demolishing portions of the structure. 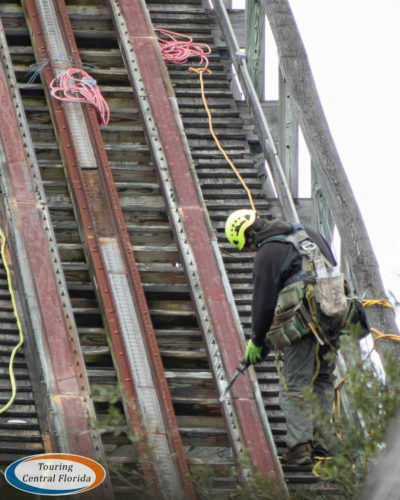 Work today was focused on the former Tiger side lift hill and in the area around it. 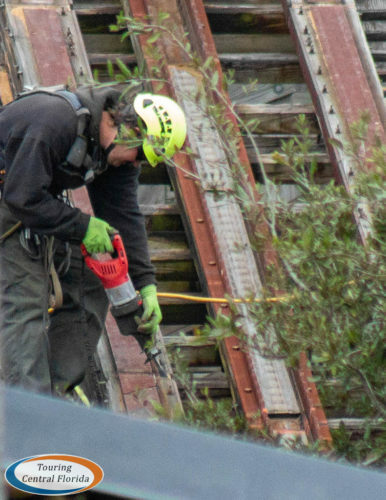 We spotted workers cutting straight through the track on the lift hill to prepare it for removal. 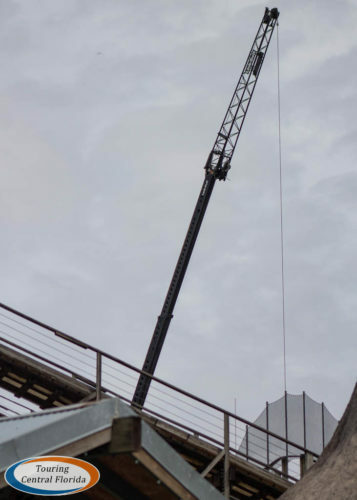 The crane that has been on site for the last couple of months was fully extended and being used to remove large chunks of supports from a track section next to the Tiger side lift hill. The second pic shows one of those sections being hoisted by the crane through some trees. 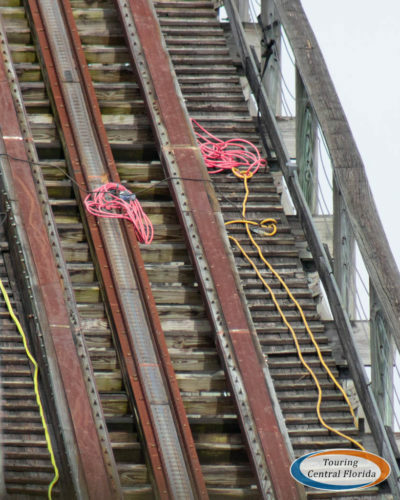 A small hill on the east side of the coaster, next to the Tiger side lift hill, recently had its track removed. There has still been no official announcement from the park on exactly what will happen with Gwazi, beyond being teased for a revamp of some kind set to open in 2020. 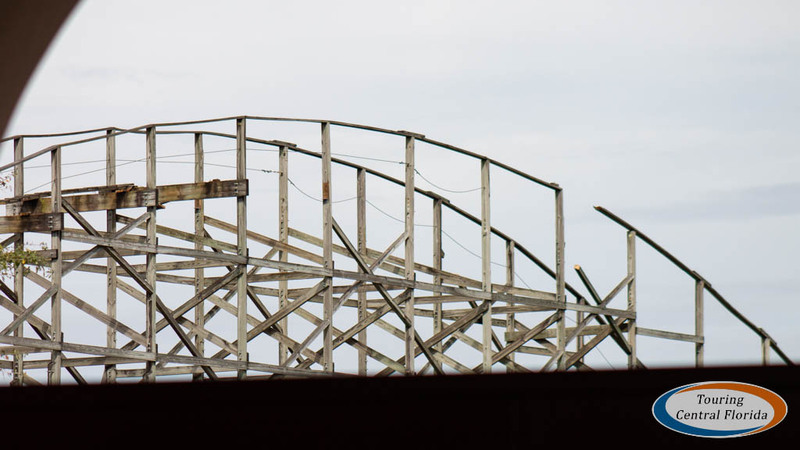 It’s unclear just how much of the original structure will remain, but so far entire sections have been removed down to the footers, including in the center of the roller coaster’s layout as we detailed in our last update. Current rumors circulating online suggest the new roller coaster will feature a lift hill of over 200 feet and feature the reuse of both current lift hills in some fashion. The rumor is based on a report in a recent edition of a European coaster club’s magazine which also states the ride will not be dueling like Gwazi was when it opened in 1999. 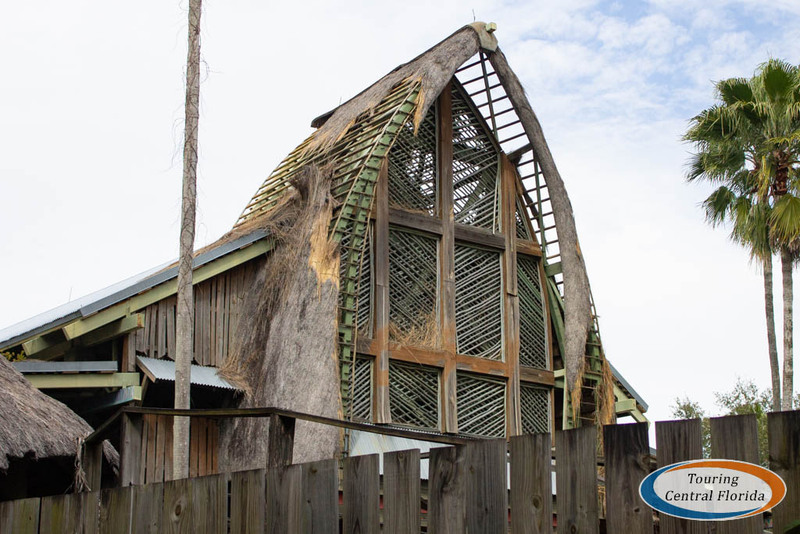 Whatever the new roller coaster ends up being, be sure to stay tuned to our website and social media feeds (linked below) for the latest on Gwazi and other projects at Busch Gardens Tampa. Join in the conversation online with #BGTProject2020 and #RMCGwazi. For the latest on Busch Gardens Tampa and other theme parks, attractions and more across the region, be sure to follow Touring Central Florida on twitter @TourCentralFL, @androckb, @Emmet_TCF, @JacobTouringCe1, and give our facebook page a like. Gwazi was long overdue to get the RMC treatment, and I can’t wait for it to finally reopen as a hybrid.